O2D proudly presents the next installment in the Vampire Legends saga, based on another strange real-life event! You always wanted to visit New Orleans, and now you've finally made it! Walking through the French Quarter, you take a photo of a house that belonged to the infamous Carter brothers, who were recently executed for a string of murders. But the photo reveals more than you bargained for – the ghostly silhouette of two men. As you start to investigate the history of these bloody brothers, you begin to realize that they may be more dangerous dead than alive... and they aren't the only things lurking in the shadows. Are there really vampires in New Orleans? And how are the Carters connected to them? Find out before you become a midnight snack in this chilling Hidden Object Puzzle Adventure game! Damon, a dark, handsome vampire cursed by an evil vampire queen, meets Victoria, a curious, young woman determined to save her village. After their chance meeting, each discovers the other can help overcome these dire circumstances. 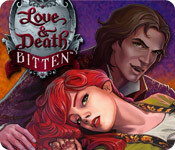 In Love & Death: Bitten, a Hidden Object Adventure, youâ€™ll play as Victoria by day and Damon by night, solving unique puzzles, collecting and combining hidden items and unlocking secret passages. Will Damon and Victoriaâ€™s story end in loveâ€¦.or death? Welcome to the world of magic, riddles, and unmanageable contradictions! Explore numerous breath-taking locations, collect vital objects, and solve mind-bending brain-teasers as you become witness to an extraordinary love story that’s sure to touch your heart and blow your mind! Is it possible for an earth-bound girl to fall for a vampire? Find out in Vampires: Todd & Jessica's Story.